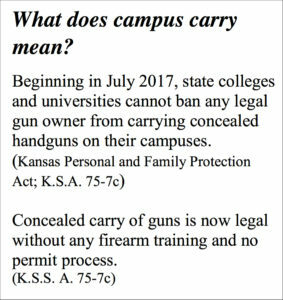 What would it cost to keep concealed weapons out of campus buildings under this law? The only locations where guns may be prohibited will be in buildings equipped with metal detectors and armed guards. If the campus closed many building entrances, keeping open only the minimum required by fire codes, the costs to equip buildings in order to prohibit guns are substantial. The estimated cost for complying with this law while preventing guns in university buildings is $110,419,000. By comparison, the total support from the Kansas Legislature to Kansas State annually is roughly $160,000,000. The military doesn’t allow weapons in barracks and classrooms. So, why should we? Increased presence of firearms increases risk of suicide and accident. Individuals who lack gun training are not equipped to respond to emergencies. In active shooter emergencies, trained first responders are trained to shoot all individuals holding weapons. Armed students make other students uncomfortable. Armed students will stifle debate. College campuses are no place for vigilante justice. Outstanding faculty will leave the university.